← Looking after her geraniums! 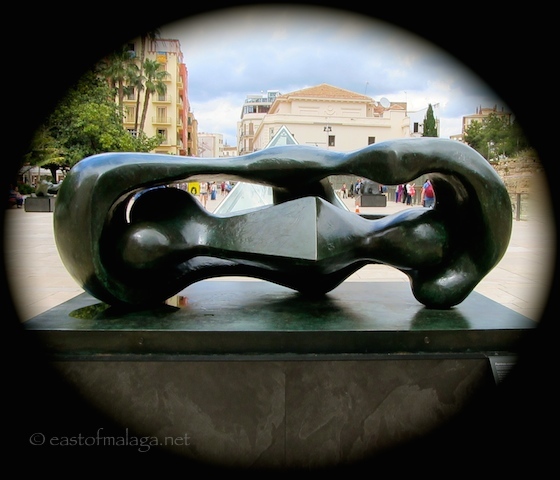 Malaga: the city that gives you Moore – Henry Moore! 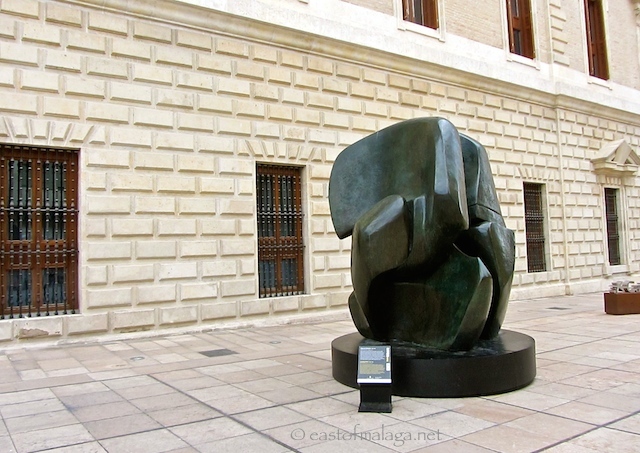 The Fundación ‘la Caixa’ sponsored exhibition, “Henry Moore: Arte en la Calle” (Henry Moore: Art in the Street) has brought some of Moore’s monumental bronzes to Málaga. 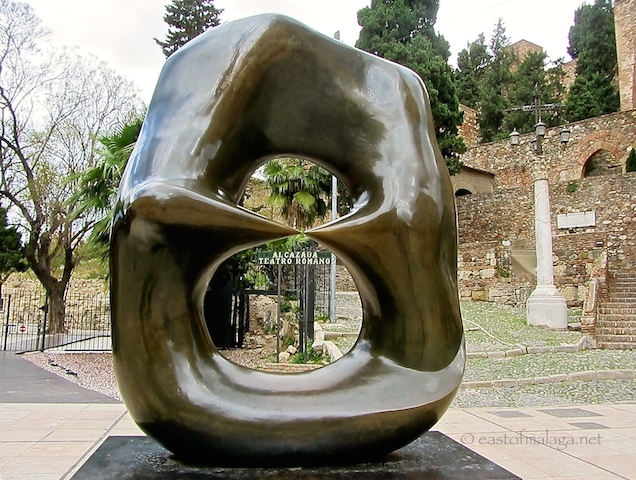 Six of British Surrealist artist, Henry Moore‘s bronze sculptures can be seen on Calle Alcazabilla, in the midst of some of Málaga’s most popular tourist attractions, near to the Alcazaba fortress, the Roman amphitheatre and the old Customs House. It’s a joy to see these modern pieces against such a historical background. You only have another two weeks (until June 28th) to view the sculptures in Málaga, before the exhibition moves to other Spanish cities including Santander, Burgos and Pamplona. 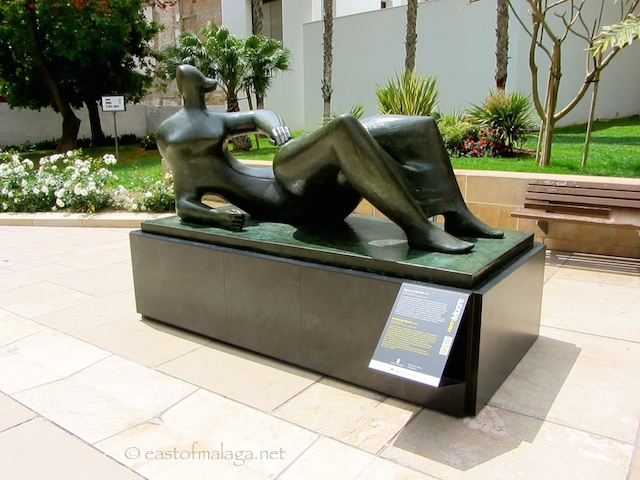 This entry was tagged Andalucía, art, culture, Europe, Henry Moore, Malaga, sculptures, Spain, street art. Bookmark the permalink. I think that first one is owned by Princeton University. I have a couple of photos of myself twenty years apart inside of it. You’re right James, there is a cast of Oval With Points at Princeton University. Don’t worry, this one is the Foundation’s cast, the one at Princeton is still in situ. Lucky you to have such a splendid showing for all to see. I love the first one, but having said that – they all all beautiful! It took me AGES to get the first shot, Dianne. 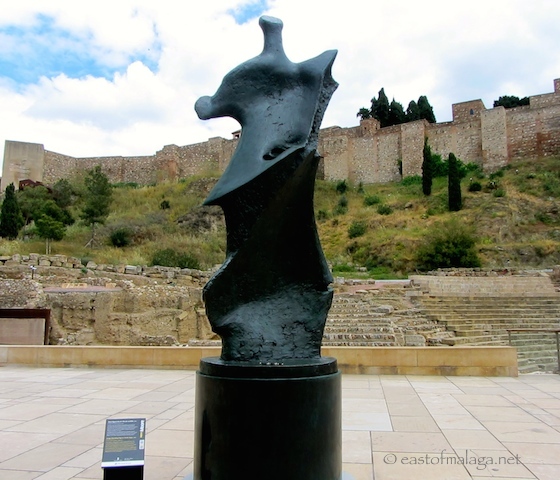 The entrance and exit to the Alcazaba is behind, and people were wandering in and out – I waited and waited to get the sign through the hole in the sculpture … but eventually I was rewarded … PHEW!!! … and these are only around the corner from the Plaza Merced (where Picasso was born) and the Picasso Museum. I can see his influence, can you, Gilly? Let’s see if we make it out there to the centre before it goes away! Although I’d like to see the look on my kiddies’ faces if I said, we’re going to take a walk to see – sculptures?? Probably be more successful if I said, we’re going to visit a site where you can play videos games for free haha! Hahaha … yes, but via the sculptures, Serena!! Fantastic! Many thanks, Marianne for a lovely Sunday read! I am going to try to go into Malaga before they move on to the next city! Perfect timing for me Marianne. I am spending the day (and night) in the city next week before returning to the UK for a few days. What a wonderful idea! So glad they are touring Spain. We have some of Henry Moore’s sculptures here in Goodwood, Chichester, just down the road: our Art students love them. Bringing art to the people 🙂 They’re wonderful! We had edexsome Henry Moore sculptures here in Sevilla last year, in a plum spot between the Alcazar and Cathedral – looks like they’ve got an equally fab location there. Art “en la Calle” is such a wonderful idea. You can stumble upon the works and enjoy them at your own pace, with that amazing backdrop. All for free! Wonderful exhibition! Looks like the same one that came to Sevilla last year. I didn’t want them to ever leave. Want me to send you new updates as they are published?